Black rack from e-bay with the original drum mountings sprayed black to match. Added an iPod holder next to the controller. Modified from an in-car mount. 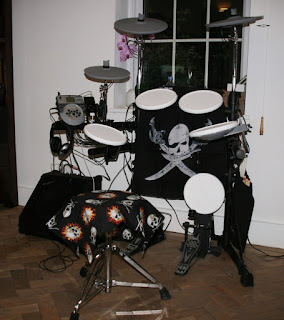 Plus, as you can see, the skull theme. These are cotton printed bandanas from http://www.bandana-world.com/ and there is also a massive choice on ebay.